At a recent press preview, I met freelance nail technician and all around sweetheart Mimi Wilson. After she did such a lovely job on my nails, I asked her to give Everything She Wants the skinny on nail care tips and trends for 2015. Mimi put herself through cosmetology school and has been doing nails professionally for three years. She even created International Nail Art Day (INAD), which is celebrated the first Saturday in August. "I was sitting at home polishing my nails and I realized that there's a National Hot Dog Day and a National Hot Chocolate Day, and I thought, 'Why isn't there a holiday for nail art?," she says. "So I created one, and now it's celebrated all over the world." "Pastels, floral designs and white nails. Also, something that I like to call lil' bits," says the Newport News, Virginia native. "Adding a metallic dot near the cuticle line or a "racing stripe" down the middle of your nail gives a solid color mani a lil' bit of pop to give your manicure a personal touch. A lil' bit of something extra just for you." "Along with getting regular manicures, nail health has a lot to deal with what you put into your body, she explains. " Eating healthy and taking your vitamins are a sure way to get great looking, healthy nails." Is nail art for everyone? "Nail art is very personal," Mimi says. "I love nail trends and following what's in for the season. But I also believe in doing what feels good for you. If you want to wear black nail polish in the middle of the summer or bright yellow in December, do it. Nails are a representation of [your individuality]. So if you like it, do it." 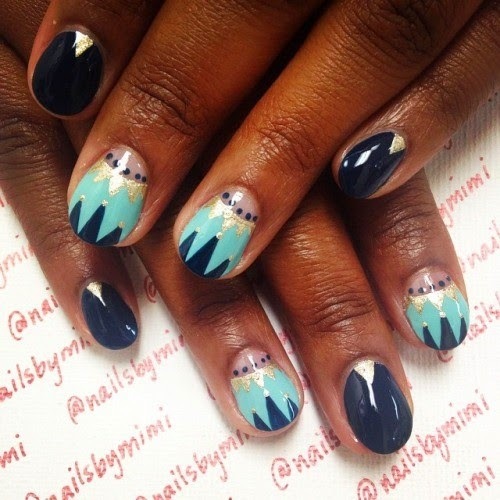 To see more of Mimi's work or to book her to your next bridal shower, bachelorette party or event, go to her StyleSeat profile and follow her on Instagram @nailsbymimi.